This recipe can also be found on the bottle of your Nellie & Joe's Key Lime Juice bottle. If you local grocery store doesn't have Key Lime Juice, try Whole Foods. Or Amazon. Do not, I repeat, DO NOT use Lime Juice. 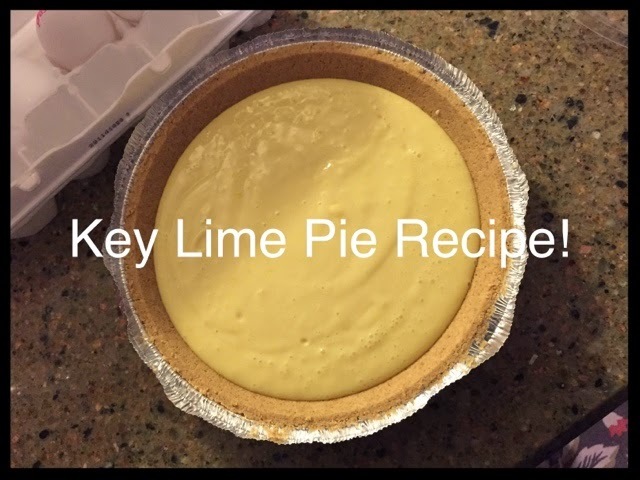 If you Google Key Lime Pie recipes, recipes show up with Lime Juice. It is not the same thing and you end up with Lime Pie instead of Key Lime Pie. Combine all of the ingredients, blend until smooth and pour the mixture into the pie crust. Yup, it is that easy! Oh, and you should add an extra squirt or two of Key Lime juice. It makes all the difference. This part is to taste, but a generous extra squirt or two makes a huge difference! Let the pie stand for 10-15 mins, and then stick it in the fridge. You want to make sure to let it sit in the fridge for a few hours. This helps the pie set. This recipe is great to make the night before you need it, or the morning of if you are crunched for time. One 14 oz can of sweetened condensed milk and 3 egg yolks. Add 1/2 a cup of Key Lime Juice. Don't forget the extra squirt to taste of Key Lime juice. I swear it makes all the difference. Pour the mix into the pie crust. Let is stand, put it in the fridge and enjoy a few hours later!